A powerful and strong-willed business magnate, played by the incomparable, multi-awarded thespian, Vilma Santos, seems to have it all--money, fame, power. When she finds out that she is gravely ill, she meets similarly strong-willed caregiver, Angel Locsin. 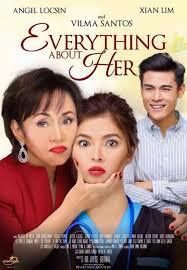 Their relationship is further complicated by the estranged relationship that Santos shares with her own child, Xian Lim. These three main characters engage in a beautiful story of acceptance, love and forgiveness.